The agreement aims to promote communication and understanding between the regions and develop cooperation in the fields of science and technology, culture, education, sport and tourism. 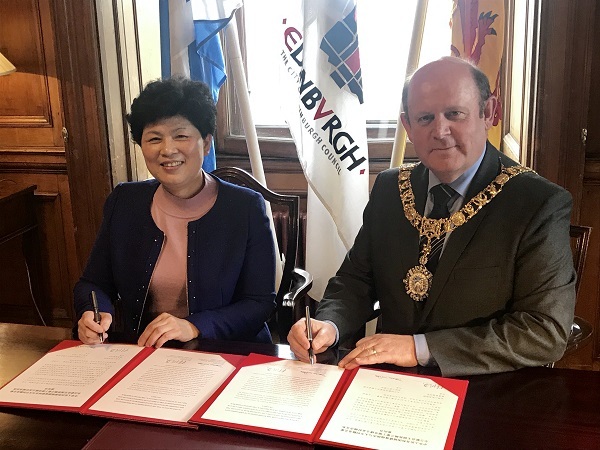 It follows a positive exchange of visits between the Lord Provost of Edinburgh and Ms Lin Xiaoying, who accompanied Consul General Xinchun Pan to sign the letter of intent in the City Chambers. John Donnelly, Chief Executive of Marketing Edinburgh, added: “We have been working closely with our colleagues across the city for some time to establish enhanced connections with China, and just recently were delighted with the announcement that Edinburgh will now have a direct air link to Beijing, a great indication Edinburgh’s global significance and a great opportunity to develop new and existing business links between Edinburgh and Asia.